Vicky Cruz wasn’t supposed to wake up. That night, when she swallowed all those pills and laid in her bed, it was meant to be her final act. But she is alive. Saved in the nick of time. Waking up in Lakeview Hospital leaves Vicky with two choices. Go back to the routine she can’t stand and try to kill herself again, or stay at the hospital and try to work things out. Despite her father and step-mother urging her to return back to life as normal after her little “fluke”, Vicky chooses to stay and work things out in Group Therapy. Gabriel, Mona, E.M., and Dr. Desai spend the next week trying to help each other figure out if and what makes life worth living. This story was an amazingly honest look at what Depression and mental illness are. It wasn’t preachy. It wasn’t in your face. It was just a gritty, honest look at what depression looks like through many different pairs of eyes/opinions. 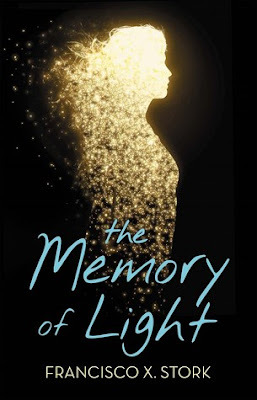 The Memory of Light also has a true story behind it. Thirty-seven years ago, author Francisco X. Stork swallowed a handful of pills in an attempt to end his life and was found in the nick of time. You can tell this book is written from someone who knows. Who understands. Who has had years to ponder on this subject. There was an excellent group of characters, each on a journey to their best mental wellness. While it’s a heavier subject, I didn’t feel the unbearable weight that some times come with these stories, thanks to the way the characters were written. This was one that I couldn’t put down, and it was the change of pace that I have been looking for in my reading. I suffered a bit of postpartum depression a couple years ago and have had moments in my life where I have questioned my own worth as a human being. I think we all have. I found this read therapeutic, thoughtful, insightful, realistic, reasonable, useful, and hopeful. I have read a lot of books about suicide and bullying, but I can’t remember one that walked the path of depression like this. I hope someone that needs this kind of book reads it. I am glad for some gained understanding and empathy into a subject that I am more aware of lately.